Hands-on extra-curricular business development programme STARTER provides knowledge and skills for student start-up projects and helps teams to shape their ideas into tested business models. 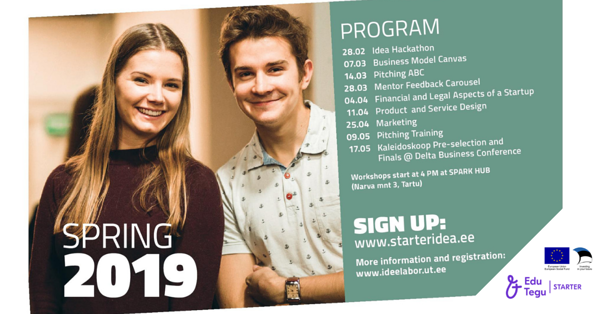 Semester-long STARTER programme consists of workshops that guide teams from ideation to business model. Teams receive individual mentoring from start-up founders or entrepreneurs and regular performance evaluation from instructors. The programme ends with business and project ideas competition Kaleidoskoop that has a number of cash prizes and access to start-up ecosystem services. There are STARTER programmes also in Pärnu and in Narva. More information and registration on our website!